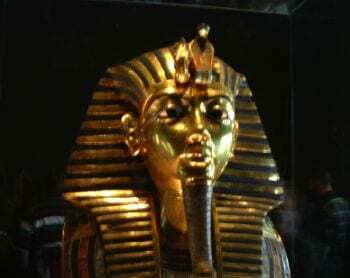 Diagnostic imaging of King Tut’s mummy suggests the pharaoh may have had a slightly cleft palate. Last year researchers reported in Nature Genetics their discovery that a SNP in the gene IRF6, on chromosome 1, is associated with clefting of the lip and/or palate. About one child in 700 is born with clefting, which results from improper fusing during fetal development of the different elements that will make up the lower part of the face. Though some rare conditions are associated with clefting, most cases do not have any identifiable cause. Now an international team led by German researchers has discovered a second genetic marker that increases the odds of cleft lip and/or palate six-fold among people who inherit the high-risk version of the marker from both parents. Birnbaum et al. genotyped 224 people who had been born with cleft lips and/or palates and compared them to 383 controls. In the most recent issue of Nature Genetics they report finding an association between clefting and a cluster of SNPs on chromosome 8. The most statistically significant association was with rs987525. Subjects with one A at the SNP had 2.57 times the odds of clefting compared to those with a C at both copies. And subjects with an A at both copies had about six times the odds of clefting. The stretch of chromosome 8 where rs987525 is located is a particularly featureless region of the human genome, so it is difficult to pin down the mechanism behind the association. But whatever that mechanism is, the authors estimate that it accounts for 41% of the clefting cases in the population they studied. Clefting is most common among Asian populations, with intermediate incidence among Europeans and the lowest rates observed among Africans. Yet the high-risk version of rs987525 shows the opposite distribution; it is almost three times more common among Africans than Europeans, and nearly absent among Asians. In their Nature Genetics paper, the authors offer several possible explanations for this anomaly. It could be that there are other genetic or environmental factors associated with clefting that remain undiscovered, or that the linkage between rs987525 and the as-yet-unknown genetic mechanism it is pinpointing differs in the various continental populations.